Oh yes! It's the time of the year when up and coming food businesses, food-lovers and food-bloggers converge. When foodie entrepreneurs bring out their most enticing products and bring forth foodies from all corners of the metro to sample and judge each business participants. Want to take the bite? FOODGASM IV, UP Ecosoc will be organizing its main fundraising project, the fourth edition to the highly successful Foodgasm events that took place last August 31, 2013, March 09, 2013 and August 25, 2012. Foodgasm IV is an event that aims to highlight 30 upcoming food businesses and their best dishes through a food tasting competition to be judged by 800 foodies, well-known food bloggers and respected chef-judges. 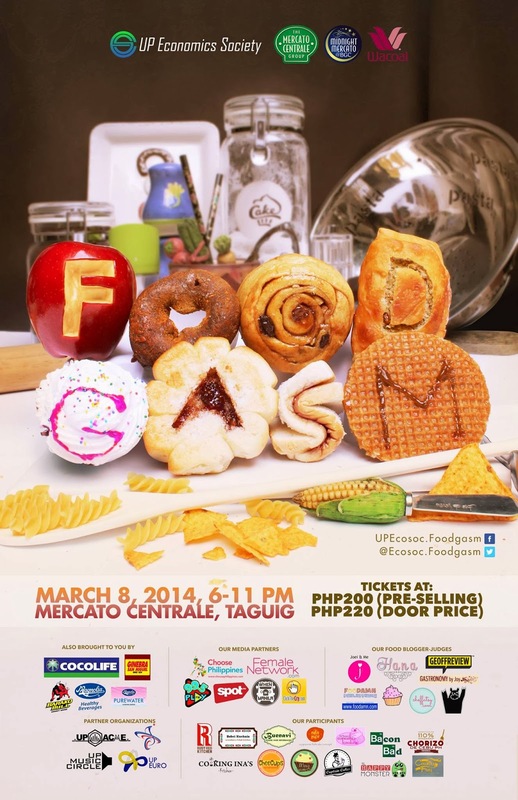 This food festival is to be held on March 08, 2014, Saturday, 6pm-11pm, in Mercato Centrale, Bonifacio Global City, Taguig.